This popular villa is located on the Palm Villa and Apartments Resort. Featuring 3 bedrooms and a private pool and garden, it is ideally located in the popular of Pernera near Protaras, within a short walk to the resort centre and beaches. 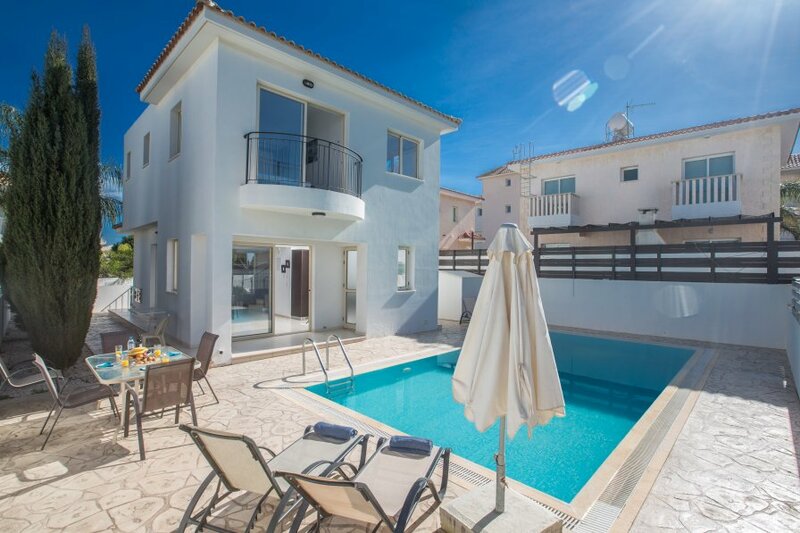 The villa has been carefully furnished to provide you with the all the facilities that you will require for a comfortable self-catering holiday. Upstairs features 3 bedrooms, 1 en-suite and a main bathroom. The open-plan downstairs area has a cozy living area with satellite TV. The dining area seats 6 persons. This popular complex is ideally located just 2km from the centre of Protaras, 3km from the town of Paralimni, and only a short stroll away from the restaurants, bars and shopping centre of the Pernera area. Pernera has so much to offer and there are a wide variety of lovely restaurants, bars and places to visit. Enjoy a walk along the new seafront boardwalk which runs from Pernera into central Protaras or sit back and enjoy the view in one of the many beach bars. Enjoy glass-bottom boat trips, white-knuckle watersport rides and fishing trips from the harbour in Pernera, or take a sightseeing boat trip to the abandoned Ghost Town of Famagusta, just to the north of the area. A great villa in a fantastic location !